Maraliz is a wellness guide equipping others with the tools to deal with stress by shifting their unconscious reactions to chosen responses. Her methods have helped her transition her own body from a state of severe disability to remission. She is a certified sound practitioner, yoga instructor, meditation facilitator, dj, and sound designer who offers workshops, sensory events, original recordings and teacher trainings around the United States. She guides her students through increased self awareness, yoga therapeutics, meditation, and sound vibrations using her kinesthetic instruction, all while living with chronic illness and physical disability. Sonic mindfulness has been an integral part of her work for the past three years. Her certification was completed under she has studied with Sara Auster in NYC and Silvia Nakkach, Dr. John Beaulieu, Wendy Young, Lynn Tran and other industry pioneers. Maraliz completed her yoga teacher training while undergoing chemotherapy in 2015 after which she shadowed Jyl Kutsche for 8 months in therapeutic yoga at the Dallas Yoga Center. Her transmission ceremony of Thich Nhat Hanh’s Five Mindfulness Trainings was completed with Terry Cortes-Vega at the Dallas Meditation Center. 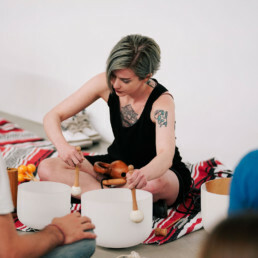 Maraliz now helps others ease stress with vibrations and movement using personal recordings, Himalayan/crystal singing bowls, tuning forks, violin, vocal looping, synths and percussive instruments.